The Kenmore Elite HE4 is a high-efficiency dryer that comes in both gas and electric models. Providing a wide variety of features to customize drying your clothes, the Elite HE4 is also offered in several different colors. When you encounter problems with your Kenmore dryer, the manufacturer recommends walking through some troubleshooting steps so you can attempt to resolve the situation on your own before contacting your retailer or Kenmore for service support. Clean lint from the lint trap, exhaust vent and outside exhaust hood to improve air movement. Check the exhaust vent for kinks or blockages, which restrict air flow and inhibit the Kenmore Elite HE4 dryer's efficiency. Make sure that the room where your Elite HE4 is located is warmer than 45 degrees Fahrenheit. The dryer will not operate effectively at temperatures around and below 45 degrees. 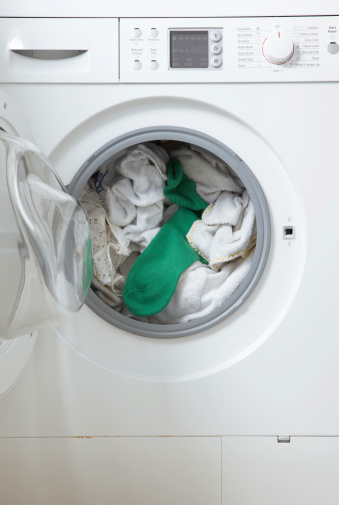 Check the load of clothes for overloading, and remove clothing so you have a smaller load that the Kenmore dryer can effectively dry. Remove any coins or pens if you find them, as they might stain the clothes and will cause the Elite HE4 to thump or ping while running. Likewise, check the pockets for tissue or paper left in pockets that will shred and disperse into the clothing, and can be hard to remove. Extend or start a new drying cycle if the clothing was rinsed in cold water or put in the dryer overly wet. It will take extra time to dry the clothing in both circumstances, says Kenmore. Confirm you selected the proper cycle, pressed "Start" and closed the door completely. Confirm that the power cord of the Elite HE4 dryer is plugged securely into the electrical outlet, that the home's circuit breaker has not tripped and that there are no blown fuses in the fuse box. Kenmore recommends resetting the circuit breaker and replacing a blown fuse with a time-delay fuse.